I remember when. Today, conversations that recall an era when there were only a handful of broadcast channels, no internet, and only a few repertory houses for relief do really sound like dad or grandpa reminiscing about World War II or Vietnam: a nod to a time that seems at once tedious and unimaginable. Yet amidst the largesse of today’s media landscape, the avalanche of representations and the self-curated schedules of viewing, it’s hard not to fret over what is being lost: a sense of shared experience, an ability to influence a broad public with a breakthrough work, a sure knowledge that the most important film or television program or webcast can have the impact of . . . a meme? The viewing fatigue is as real as data overload and just as managed as any tentpole movie release. To me, that increases the value of critical acumen and debate, the need for a knowledgeable council of elders to raise the debate above the promotional fray and preserve the ink-stained standards of the field. Alas. As the editor of this august journal, I land on certain lists. And receive certain inquiries. In recent months, that has included contact from a new source: a service pitched to editors, seeking to sell news stories and spare me the trouble of seeking out actual writers. Perhaps you can imagine the pitch. I’ve been offered interviews with Brad Pitt, Jack Black, Tina Fey, Mia Wasikowska, and more, in transcripts that can be tailored to the length I desire, spun into stories, or delivered raw. And the themes: celebrities with getaways in Europe, actors turned directors, actresses with children, and so on. 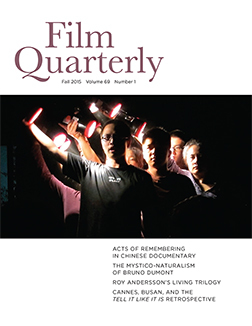 Perhaps it is just a matter of time before I open my email to order up the contents for the next issue of the new FQ. Or maybe not. Campaign spending has reached the domain of documentary, where for years the votes were more likely to be made according to lowest-common-denominator subject than highest-common-denominator budget. Documentary was long a more egalitarian arena in filmmaking, one where women and people of color had a more equitable shot at entrance and success. I worry that documentary’s loophole of access is fast disappearing in the face of industry-standard budgets. If a dubious Indiewood standard has indeed invaded documentary and come to prevail, then alternate awards such as the IDA (International Documentary Association) awards in December will become more important to create, invest with status, and celebrate. In the meantime, there is another remedy that ought to be considered: the creation of a new and separate category for foreign-language documentary. In a year that saw the release of Patricio Guzman’s The Pearl Button, Hubert Sauper’s We Come as Friends, and Joshua Oppenheimer’s The Look of Silence (although since he is American, it is somehow not seen in this category), among many other strong pieces of work, it seems increasingly outrageous that there is no separate category for work in documentary that originates elsewhere. Given the currents of xenophobia sweeping the United States, it strikes me as urgent to get other points of view into circulation. And other languages: as I often think, while examining with curiosity the dearly held rejection of subtitles in movie viewing here, perhaps if Americans got to hear other languages, got to see other peoples’ perspectives, there would be less of a rush to bomb them all. Imagine if Rithy Panh’s ground-breaking The Missing Picture, which was miraculously nominated last year for best Foreign Language Film, a category it clearly had no chance of winning, could have been nominated instead in a category of best Foreign Language Documentary. Very possibly, the brilliant director would have had a little gold man sitting on his desk in Phnom Penh. 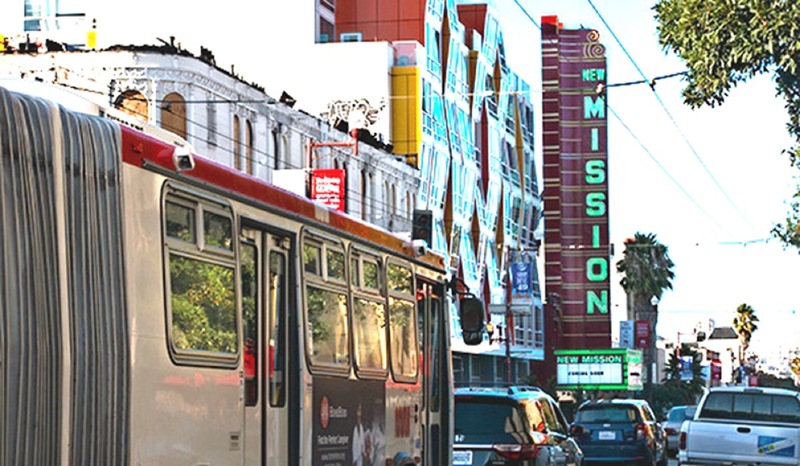 The marquis for the New Mission Theater in San Francisco stands head to head with the new condos for tech workers in the Mission District. Surely there is a case that can be made in language(s) the Academy members can understand. Diversity does not stop at the US border, after all: it’s time to diversify the documentary category globally. So, won’t you please—you know who you are—send a memo to the Academy? And, a note to critics’ associations: it’s easy enough to add the category to all those lists bubbling out of cities coast to coast now, too. It’s not over until it’s over: despite the clear challenges to movie-theater existence, the past year has brought unexpected harbingers of hope. 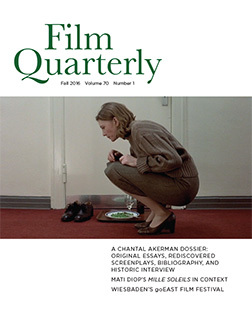 In 2014, Quentin Tarantino took over the running of LA’s New Beverly Cinema, where he’d already been a part owner for several years, to program it himself; there he shows films on 35mm only to appreciative crowds.2 In New York City, there is another rebirth: the construction of a brand-new duplex, the Metrograph, the brainchild of Alexander Olch, on Ludlow Street on the Lower East Side, with the capacity to play 35mm as well as the omnipresent DCP digital format.3 And in San Francisco, Tim League’s Alamo Drafthouse has spent more than a year rescuing and restoring one of the late great movie palaces that reigned over the neighborhood before falling into decay and decrepitude (one became a parking lot, others turned into cheap storage).4 A pre-opening tour revealed the New Mission Theater to be a sumptuous facility with all the Timothy Pflueger trimmings, repurposed into a five-screen house with both 35mm and Sony 4K digital projection, retrofitted to the Drafthouse model: new and classic films in theaters of varying sizes, with cocktail tables and food/drink deliveries direct to the seats: a nightclub version of movie-watching. Strand Releasing’s Marcus Hu looked around, wide-eyed, and confessed it was his first time setting foot in the theater since the 1970s, when he used to skip out of class at his nearby school to watch movies there. FQ columnists have a lot to say this spring. At a time of rising regionalism and pro-independence movements in the UK and Europe, Paul Julian Smith finds that Catalan cinema is not easily defined (hint: language isn’t everything). Amelie Hastie, examining The Assassin with the help of Bazin, spots a trace of orientalism in critical and audience responses to the film. Regular contributor Megan Ratner interviews László Nemes about his remarkable debut film, The Son of Saul, which she analyzes in terms of its visual acuity and his extensive research into the lives of the Sonderkommando. 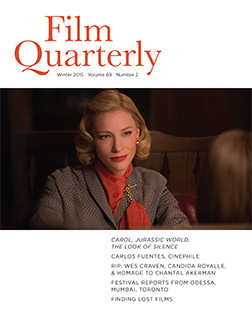 Festival reports continue to bring readers a sense of film culture around the world. 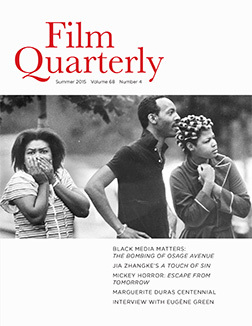 Christine Acham assesses the importance of the trinidad+tobago (deliberately lowercase) film festival and its important role in developing a Caribbean film culture across language boundaries. Randy Malamud, inspired by the Supreme Court’s gay-marriage decision, visits MIX Copenhagen on the occasion of its thirtieth anniversary celebration and assesses the mood of queer film today. And, Vito Adriaensens travels to Pordenone to see this year’s treasures unearthed on screen, to assess the contribution of the festival’s canon-making slate. This issue’s book reviews are as always a mainstay of the journal. Chief book critic Dana Polan probes McClain Clutter’s fine inquiry into the effect of cinema on urban design in his Imaginary Apparatus: New York City and Its Mediated Representation. 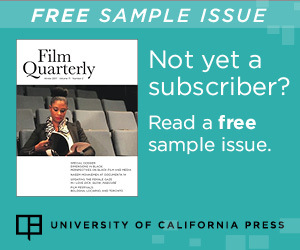 Regina Longo offers a look back in time, chatting with editors Anton Kaes, Nicholas Baer, and Michael Cowan about their massive anthology, The Promise of Cinema: German Film Theory, 1907–1933, with selections for download on the FQ website. Other reviews take up books by Mary R. Desjardins, André Gaudreault and Philippe Marion, J.R. Jones, Emmanuel Levy, Adilifu Nama, and Shelley Stamp. 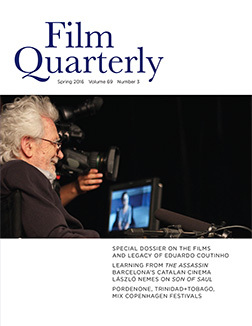 When I assumed my post as editor of this journal in 2013, I had one immediate dream: to organize a dossier on the documentaries of Eduardo Coutinho. Consider this issue as fulfilling that long-delayed promise. I have a personal reason for wanting to call attention to his work, one that dates back to my first trip to Rio in November 1984.5 That was a thrilling time in Brazil, as the military dictatorship was crumbling, massive demonstrations were taking place, and the country was on the cusp of ratifying a new constitution and electing a president. After two decades of military rule, this was a liminal time of excitement and possibility. People were jubilant. In that atmosphere, the Rio Film Festival was founded to revive Brazil’s pre-coup cinephile culture and jump-start the return to civilian governance. The film festival opened with the world premiere of a new Brazilian film that promised to encapsulate this cultural and political moment. It was Eduardo Coutinho’s Cabra marcado para morrer (Man Marked for Death, Twenty Years Later, 1964-1984). The opening night took place in an enormous theater that was sold out and packed full. As the film played, the audience became one with the screen. I don’t think I’ve ever witnessed such a screening or such a response, with a standing ovation that must have gone on for half an hour or more, applauded by an audience that refused to leave the theater, staying to cheer and shout and laugh and cry and talk to one another, unburdening themselves of history and pain and repression with every clap. In the thirty years since that screening, even as he made more than a dozen films, I have looked in vain for Coutinho’s work to appear on US screens, critics’ lists, streaming platforms, and syllabi. Apart from the attention paid him within the realm of Latin American cinema studies, there has appeared to be little awareness that one of the century’s most important documentary figures was gliding beneath the radar—and, in 2014, passed away entirely. RIP, Coutinho. It was high time that this champion of conversation, and of the camera’s ability to communicate the exceptional character of the ordinary citizen within the quotidian framework of lived experience, be awarded a platform of his own in these pages. Thus I was inordinately pleased that Natalia Brizuela agreed to take on the work of editing this special dossier with me, contacting its authors, and personally traveling to Rio to meet with José Carlos Avellar and gather the photographs published in these pages. 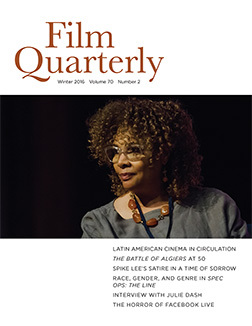 Her work with Kathy Geritz at the Pacific Film Archive to present a selection of Coutinho’s films in conjunction with this issue further extends the reach of the issue and its attention to Coutinho’s legacy. 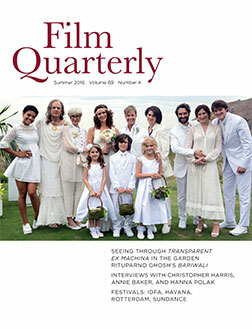 Film Quarterly is grateful to the dossier’s contributors. The legendary José Carlos Avellar allowed this translation and condensation of his landmark interview with Coutinho, his old friend. Now ensconced at the Instituto Moreira Salles, Avellar has been a central figure in Brazilian cinema culture for more than half a century. He also generously shared his library of images that grace these pages throughout the dossier. Ismael Xavier, the longtime scholar of Brazilian cinema, allowed this translation of his own classic piece on Coutinho’s evolving approach to documentary. Not many scholars can claim to influence their object of study, but Xavier’s analysis of Coutinho’s approach in this essay led the master to salute him with a film named after his concept. Consuelo Lins, who had followed much of Coutinho’s career, traces his radicalization of the form, from his interest in linguistics to his interrogation of his own role in the conversation. Now, a new generation of scholars is making Coutinho their own, situating his work in the context of documentary studies and cinema studies today. Cecilia Sayad, considering Coutinho’s work as an evolving performance of authorship, looks acutely at moments of both excess and withdrawal. Finally, Natalia Brizuela looks at Coutinho’s body of work through the lenses of temporality and duration, finding there a dimension of theatricality arising out of the quotidian. Coutinho’s final film, Últimas Conversas (Last Conversations), which was completed after his death by his longtime collaborators, is beginning to make the rounds— just in case anyone still needs a reason to push for establishing a parallel documentary category for foreign language (aka non-Anglophone) documentary. Just saying. 1. Anthony Kaufman sounded the alarm on documentary award spending in “Reality Checks: Oscar Doc Campaigns Have Become Fast, Costly and Out of Control,” Indiewire, December 10, 2015, at www.indiewire.com/article/reality-checks-oscar-doc-campaigns-have-become-fast-costly-and-out-of-control-20151210. 2. Anne Thompson, “Quentin Tarantino Enjoys Running the New Beverly, Even When He’s Shooting a Movie,” Thompson on Hollywood, Indiewire, May 4, 2015, at blogs.indiewire.com/thompsononhollywood/quentin-tarantino-enjoys-running-the-new-beverly-even-when-hes-shooting-a-movie-20150504. 3. Cara Buckley, “New Cinema Planned for Lower East Side,” New York Times, August 24, 2015, at artsbeat.blogs.nytimes.com/2015/08/24/new-cinema-planned-for-lower-east-side. 4. Sam Whiting, “Old Mission Theater to Rise Again as Gleaming Multiplex,” SF Chronicle, May 25, 2015, at www.sfchronicle.com/movies/article/Old-Mission-District-movie-palace- to-rise-again-6285656.php. 5. For an earlier version of my thinking on Brazilian cinema at this time, before and after, see “Cinema That Rolls with the Punches,” New York Times, November 29, 1998.